The Adorama "Refurbished By Canon" inventory has been significantly increased - to 67 items at this moment. Lots of great gear is available - including Canon EF 300mm f/2.8L IS USM (sold) and Canon EF 500mm f/4L IS USM Lenses. Expect like-new equipment at nicely reduced prices. "Notice to Canon 40D owners using Sigma’s APO 120-400mm F4.5-5.6 DG OS HSM or APO 150-500mm F5-6.3 DG OS HSM for Canon fitting. When the Canon 40D digital SLR is in AI Servo AF mode, and the APO 120-400mm F4.5-5.6 DG OS HSM for Canon or APO 150-500mm F5-6.3 DG OS HSM for Canon lenses are attached to the camera with the OS function switched ON, the number of continuous frames per second will decrease. To overcome this, we will start supplying a free-upgrade service to our customers from today. Except above numbers, their firmware has already been updated. I have posted ISO 12233 Chart Results from a second Canon EF 200mm f/2.0L IS USM Lens. This one is at least as sharp as the first. Attention Canon EOS Digital Rebel, XT, XTi and XSi Camera Owners - Canon is offering you an additional $50 rebate on the purchase of a Canon 40D or 5D. ISO 12233 Chart Results from 1Ds Mark III and Canon EF 300mm f/2.8L IS USM Lens are now available. It doesn't get much (any?) better than the Canon EF 300mm f/2.8L IS USM Lens, and as the linked comparison shows, it also does not get much (any?) better than the new Canon EF 200mm f/2.0L IS USM Lens. Adding the Canon EF 1.4x II Extender to the 200 f/2 does not generate results equivalent to the bare 300 f/2.8 (as expected). This comparison is now available as well. Canon has posted a behind-the-scenes look at a new Canon Rebel XSi TV commercial shot primarily with the Canon EOS-1D Mark III Professional Digital SLR. The sound track is awesome. Here is Canon's press release. Delsey Pro Digital Backpack 31, Photo/Notebook Backpack with 12" Notebook Pocket, Black. Delsey Pro Digital Backpack 33, Photo/Notebook Backpack with 14" Notebook Pocket, Black. Delsey Pro Notebook Briefcase 16, Expandable Attache for Cameras & Notebook, Black. Delsey Pro Trolley 50, Multi Format Professional Equipment Case with Wheels, Black. Delsey Pro Trolley 52, Multi Format Professional Equipment Case with Wheels, Black. Delsey Pro Bag 1, Extra Large Multi Format Camera System Bag, Black. Delsey Pro Bag 2, Large Multi Format Camera System Bag, Black. Delsey Pro Bag 4, Small SLR Format Camera System Bag, Black. Delsey Pro Bag 5, Compact SLR Format Camera System Bag, Black. It's Official! The Canon Spring 2008 Rebates (1.6 MB PDF) have now been officially announced - and the linked form (2MB PDF) is direct from Canon USA. As I expected, this is an "INSTANT" rebate - available to international buyers and unable to be denied later by an incompetent rebate fulfillment center. The rebate period runs from May 18th through July 19th. Look at the after-rebate price of the 5D and 40D - both are nice deals. Canon EOS-1Ds III-captured ISO 12233 sample crops and vignetting results have been added to the Canon EF 200mm f/2.0L IS USM Lens page. Put on your safety glasses - this one is sharp. I'll be adding the 1.4x and 2x results as I can get to them. I don't have a lot of comparables from the 1Ds III yet (try the 200 f/2.8L lens for the ISO 12233 crops), but they are coming. Also, ignore the brightness of the bottom ISO 12233 crops at narrower apertures - This is a small indicator of some major changes I've made and continue to make. I'll share more with you as I get time. The Canon Rebel XSi / 450D body-only kit is finally in stock. If you were patient enough to wait for the sans-lens version of the XSi / 450D, you can order it from OneCall.com or 17th Street Photo. Update: B&H has it as well. The Adorama "Refurbished By Canon" inventory has been refreshed. There are currently 34 items listed - a number lower than their typically refurbished inventory refreshes, but there are a lot of camera bodies including a 1D Mark III for $3,499.00. Expect like-new equipment at nicely reduced prices. Canon Digital Photo Pro v3.4.1 is now available for download. Actually, the link on Canon's site is broken - Try the direct download link if it remains broken. The big news is the mention of the Canon Digital Rebel XS/1000D in the DPP help file. To see for yourself, download the update and search help for "1000D". Results turn up three pages mentioning this model. Based on the positioning in the charts in the help file pages and based on the model number, I think a low end/low priced Canon DSLR is coming. 1-2. Adds the luminance noise reduction function for TIFF/JPEG images. You can make this setting with the [Tool Palette] tab in [Preferences] and the [NR/LENS] tab from the tool palette. 1-3. Adds a lens with the aberration correction function and supports the extender. Now supports sixteen more lenses. Newly supports the extender (EF1.4 X II and EF2 X II) to increase the variety in combinations. For supported cameras and lenses, please see the Help file (or the instruction manual). 1-4. Fixes malfunctions. Fixes a bug where RAW images shot with EOS Kiss X2/EOS DIGITAL REBEL XSi/EOS DIGITAL 450D are not displayed in accordance to the PictureStyle file settings. 2-2. Adds a correction screen. You can now choose images saved in different locations and display them on the same screen. 2-3. Improves adjustment functions. Extends the noise reduction adjustment range from 3-step (Off/Low/High) to 11-step (0 to 10). - Adds [Default noise reduction settings] to the [Tool Palette] tab in [Preferences]. 2-5. Supports more cameras and lenses with the lens aberration correction function. Adds support to EOS Kiss X2/EOS DIGITAL REBEL XSi/EOS DIGITAL 450D and nine lenses." The Canon Spring 2008 Rebates (1.6 MB PDF) have not been officially announced - but the form looks like the real deal. Once again this is an "INSTANT" rebate - available to international buyers and unable to be denied later by an incompetent rebate fulfillment center. The rebate period runs from May 18th through July 19th. The Canon EF 200mm f/2L IS USM Lens is starting to ship in the USA. 17th Street currently has the 200 in stock. Not the Canon rebate most of us are waiting for, but a significant one if you are in the market for a Canon EOS 40D or a Canon EOS 5D ... There is currently (through Aug 2nd) a $300 rebate on the Canon PIXMA Pro9000 Photo Printer (which costs just over $400) when purchased with one of the aforementioned Canon bodies. There is a $100 rebate on the printer alone, but it does not appear to be stackable this time around. Pick your preferred retailer and kit version from the review links above - the rebate form will be available from the retailer's site. If you need the printer, it is a great deal. If you don't need the printer, flip it on EBay or your favorite buy/sell forum for a resulting great deal on the camera body. Clearing up a commonly asked question regarding the Canon EF 400mm f/4 DO IS USM Lens ... Canon Inc. has confirmed (to Chuck Westfall, Canon USA) that, as of May 6, 2008, there have been no changes to this lens since Canon started selling it. Amazon.com has lowered the preorder price of the Canon EF 200mm f/2L IS USM Lens to $5,799.99. If you preordered at the original price, ask for a price adjustment (they will accommodate this request). Chuck Westfall's May Tech Tips are online at DigitalJournalist.org. 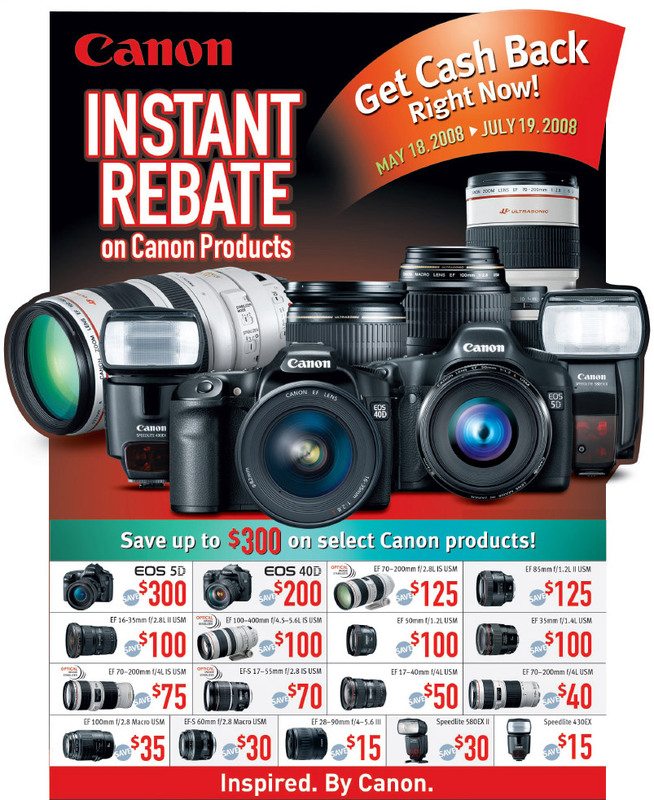 Tamron has posted a new rebate program in effect from May 1, 2008 - July 31, 2008. While still not cheap, J&R has the Canon EF 200mm f/2.0L IS USM Lens on sale for $200 off with free shipping. This lens is not in stock yet, but you can preorder to lock in this price.